He’s a saint of Egyptian origin that was very popular in the Medieval West. He went away on his own to live in the desert very early in his life, where he spend most of his live in solitude. Amongst the most popular chapters, the diabolic temptations he suffered stand out as well as his visit to Saint Paul, the First Hermit. Under his invocation, in high middle age, the Order of St. Anthony appeared and they specialized in curing contagious diseases. 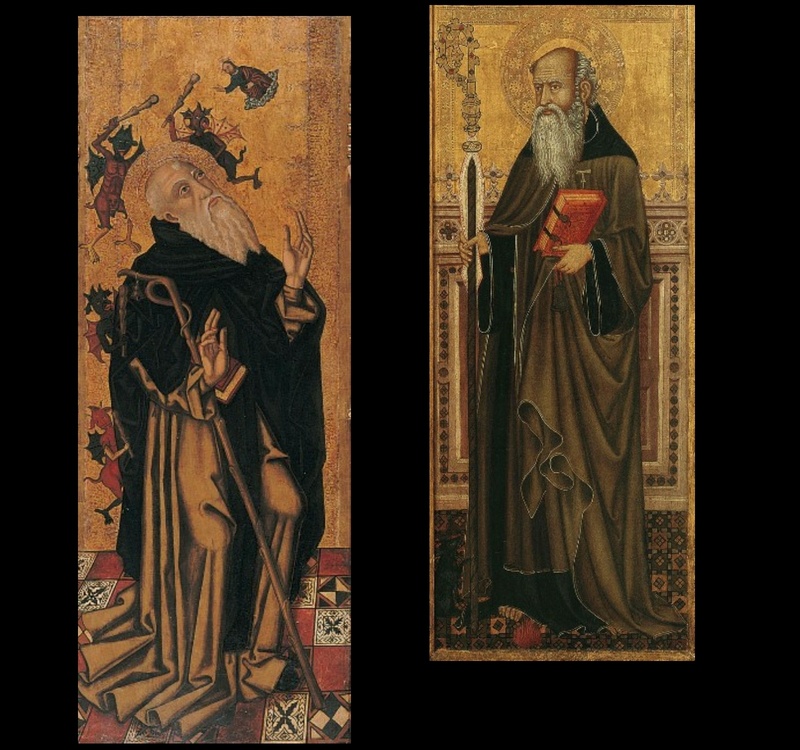 Normally, Saint Anthony is represented as an old man with a beard, dressed in sackcloth with a hood, common clothing for the monks of his order. His habitual attributes are the crosier in the form of “tau”, the bell, the little pig and the flames of the “fire of Saint Anthony” (ignis sacer), in allusion to the illness that the Antonians cured, gangrenous ergotism. Furthermore, on occasions, he sometimes appeared as a hermit tormented by the little devils that appeared in the desert, one of the most known chapters of his life. According to legend, Barbara was an Eastern Saint shut by her father in a tower only illuminated by two windows to avoid her conversion to Christianity. Even so, she found a way to become a Christian and be baptized, which is why a third window was opened as a symbol of the Holy Trinity. 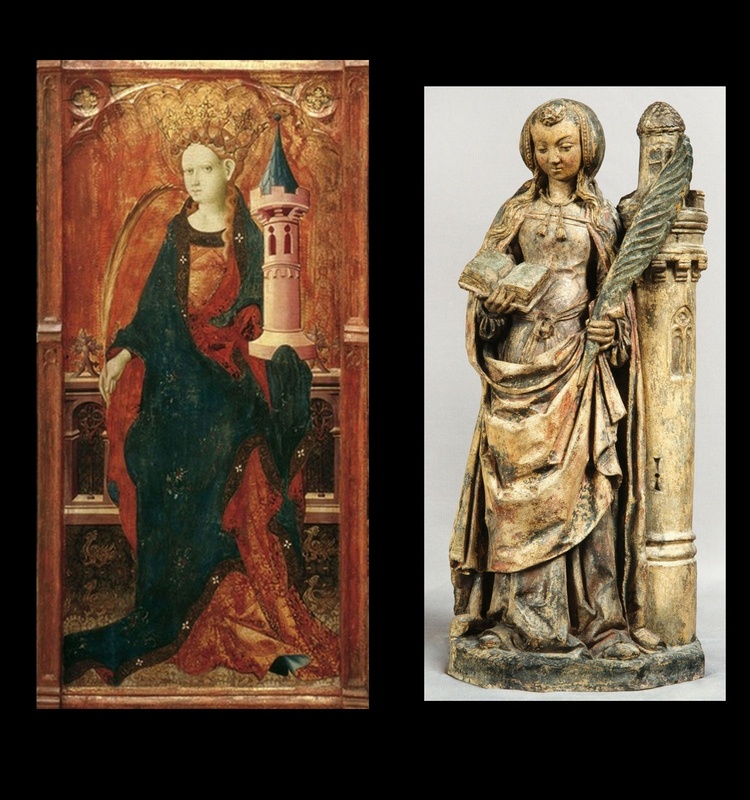 Saint Barbara has an iconography, or representation, which is rather consolidated given that she normally appears with the palm, as a saint martyr, a royal crown, given her noble lineage and, as a more representative attribute, the tower of two or three windows. Legend says, Catherine was a noble of Alexandria, who was obliged by her father to marry the Roman emperor. She refused to do so because of her “mystical marriage” to Christ but, because of it, she was condemned to multiple tortures, of which she got out unscathed, until she finally died decapitated. 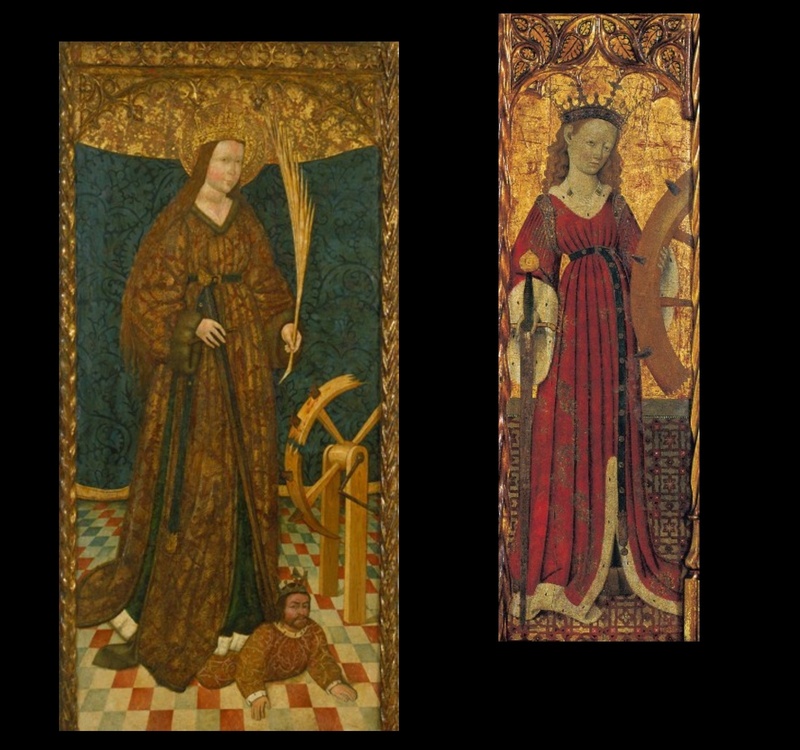 As most of the rest of the martyr saints, she is usually accompanied by the palm and, in relation to her history, she is represented as a noble woman, often with a crown. Her most universal attributes are a wheel with broken spikes and a sword. In some representations, she appears stepping on a masculine figure, the emperor, who she refused and who was the one to submit her to the torture. Saint Clare is the founder of the female branch of the Franciscans, of the nuns of Saint Clare. Born in Assisi, she was from a noble family, but in her youth decided to distribute her goods amongst the poor and follow Saint Francis. Clare lived closed in the convent of Saint Damian of Assisi as an abbess, loyal to the precepts of his poor rule. Saint Clare was sanctified only two years after her death which occurred in 1253. 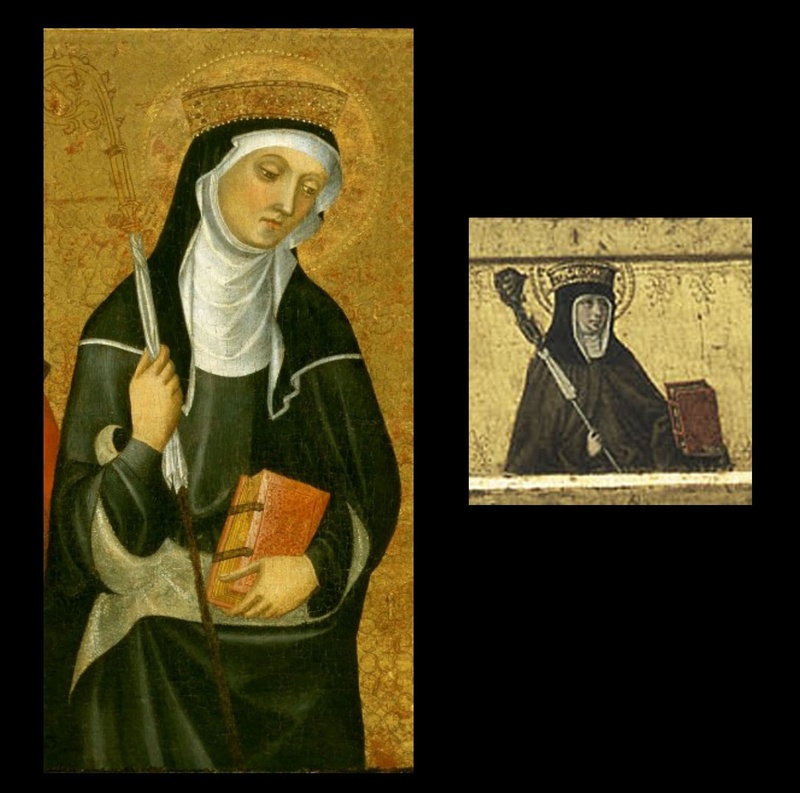 Saint Clare dresses with the habit that belong to the Franciscan nuns, with the belt of three knots, and she’s distinguished as an abbess, with her staff and book of the rule of her community. On of her most common attributes is the custody with which she rejected the Saracens of Saint Damian. Born at Caleruega (Burgos), Saint Dominic was the founder of the order of the Dominicans, which obtained papal permission in the year 1216. He was canonized very fast, a few years after his death, in 1234. One of his most prominent facets was his fight against heresy, reason for which he moved to Tolosa to battle the Albigenses. 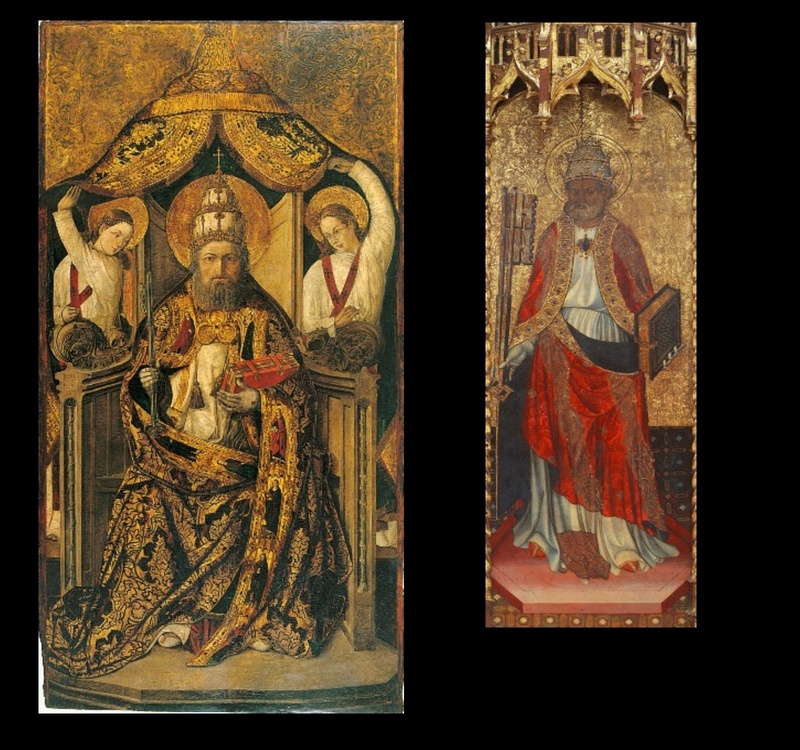 The Saint is usually represented tonsured and dressed in a two-coloured habit of the same order, white tunic and a black cloak, symbols of purity and austerity. 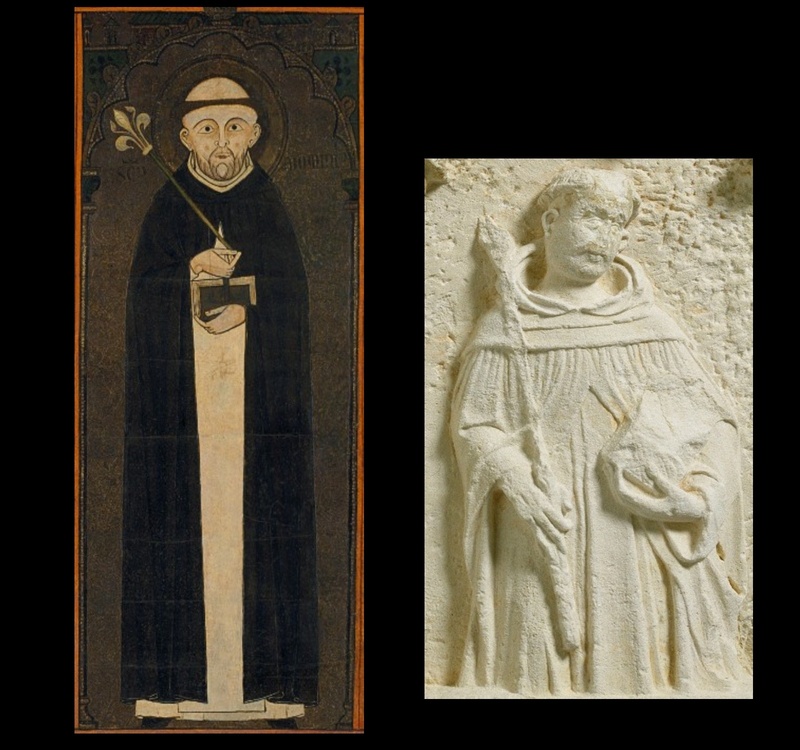 Amongst the most representative attributes of Saint Dominic was the book, common in others saints, and the lily branch, also used to identify the Franciscan saints Francis of Assisi and Anthony of Padua. James the Elder, called like that to differentiate him from the other homonymous apostle, has prominent role on the Gospels and dies beheaded in Jerusalem. Big part of his relevance comes due to a legend that considers him an evangelist of the Iberian Peninsula and places his sepulchre in Santiago de Compostela, a place that, for that reason, in the Middle Ages became one of the main pilgrimage centers. Related to this story, his image is that of a pilgrim, with a hat a wide brim decorated with the shell (venera jacobea), a pilgrim’s staff and the bag, among others. Son of Saint Isobel, and therefore Jesus’ cousin, John is considered to be the last prophet before the arrival of the Messiah and, for this reason, he’s called “precursor”. His most famous nickname derives from his activity as a Baptist on the banks of the river Jordan, in which he carried out the baptism of Christ, who he recognised as the son of God. John died beheaded upon request of Salome, daughter of Herodias and niece of Herod, who imprisoned him because he had reported their incestuous union. His representation is that of an anchorite, that is to say, one who lives apart and dedicated to the oration and penitence. That’s why he is usually dressed in a leather tunic. One of his most notable attributes is the lamb related to his designation of Christ as a lamb of God. This can be lying on a book or contained in a flabellum, which is common in Catalan art. 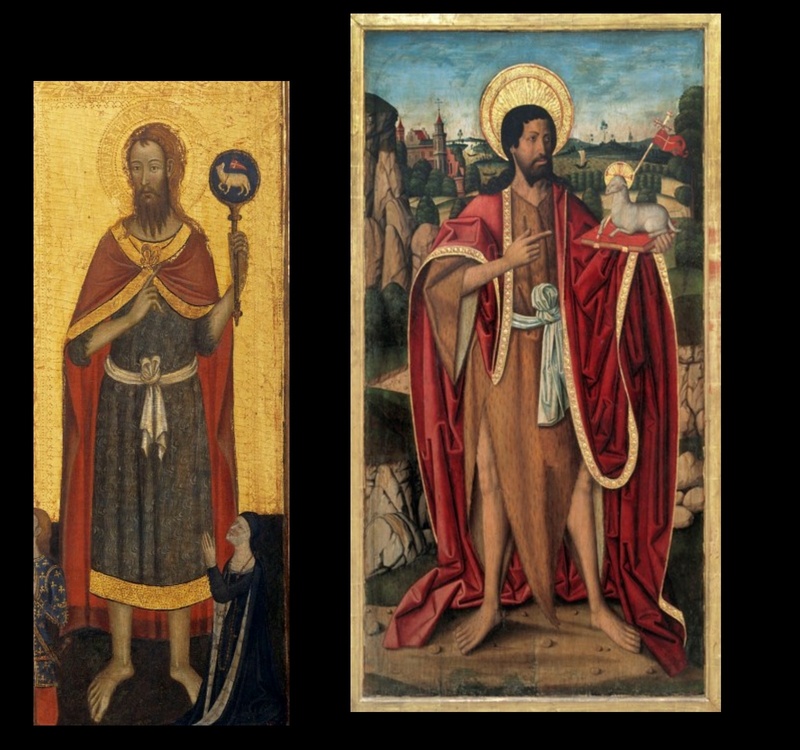 Being Saint James the Great brother, John is considered, at the same time, apostle, the youngest of all of them and Jesus’ favourite, and evangelist during his exile on the island of Patmos. In the West’s art, John can easily be distinguished from the rest of the apostles due to his youth and the fact that he didn’t have a beard. His most constant attributes are the book and the eagle. The book alludes to his facet as writer, both of the Gospel and of the Apocalypse, written on the island of Patmos, while the eagle is his symbol of the Tetramorph. He also often held a goblet that contained a serpent or a dragon, in reference to the failed attempt to be poisoned that he suffered during the period of the Emperor Domitian. Michael is part of the group of archangels, among which he’s the most powerful one. He is considered head of the celestial military, which fights against rogue angels and against the dragon of seven heads. Also attributed to him is the facet of psychopomp, busy with the passage of souls on the Judgment Day. As a defence of the Church, he usually dresses as a soldier or horseman and is usually armed with a lance or a sword. 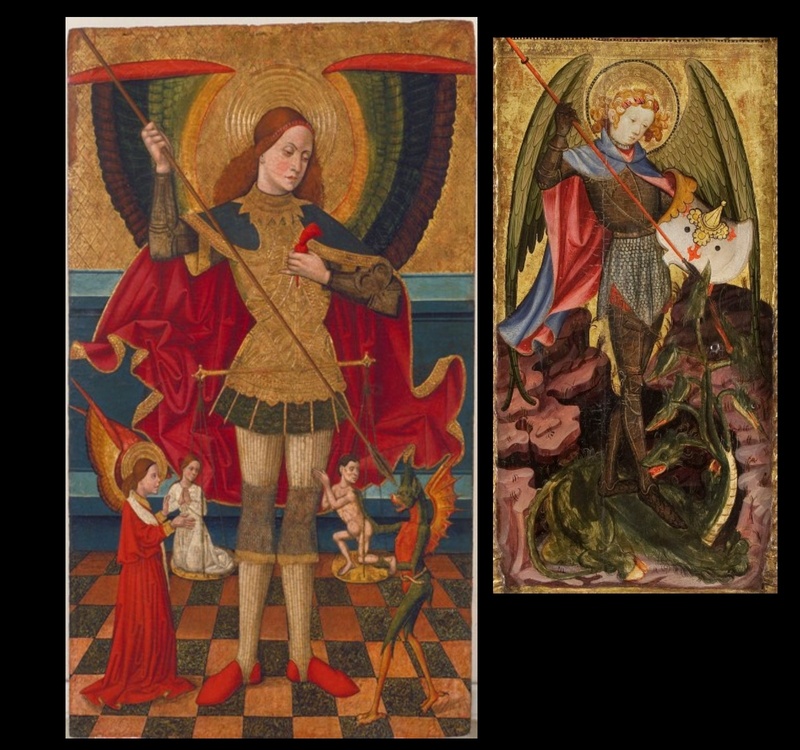 Just like Saint George, he often appears killing the dragon, but unlike George, Michael is always wearing wings. Regarding his role as judge he is also presented with a balance, weighting good and bad actions. Saul, Jew of Tarsus and persecutor of Christians, converted to Christianity when, on a trip from Jerusalem to Damascus, he fell from his horse, due to the appearance of Christ, that left him temporary blind. From that point on, he adopted the name of Paul, which signified humility. Generally he’s represented as bald and with a long beard. His main attribute is the sword, as a reference to his decapitation in Rome, which happened, according to tradition, the same day as Saint Peter’s ordeal. 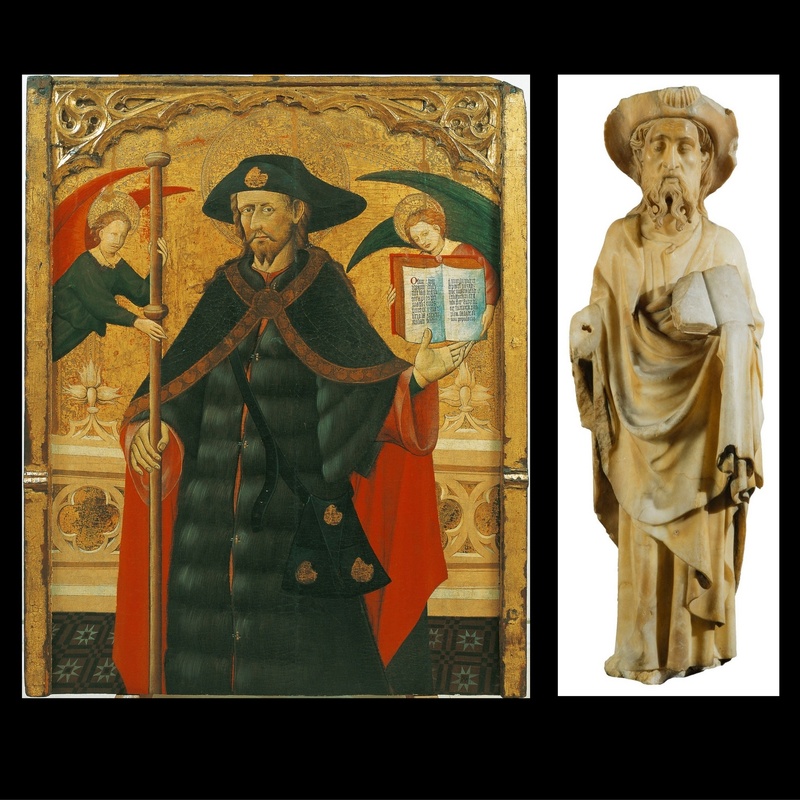 Saint Peter is considered the prince of the apostles, the vicar of Christ on earth or the doorman of Heaven. Named Simon, along with his brother, Saint Andrew, was called to follow Jesus and, since then, he took the name Peter, in metaphorical reference to the stone upon which Christ build the Church. He was the first Bishop of Rome and died martyr the same day Saint Paul, who he is often associated with, was crucified upside down. Peter usually looks like an elderly man with grey tonsured hair and short curly beard. His most characteristic attribut is they keys to the kingdom of the heavens that Christ promise’s him in the Gospel, although, as an apostle, he often also has a book in his hand. Moreover, as Peter is considered to be the first Pope of the Church, he wears the suitable attire, the triple papal tiara or triregnum. Because of his preaching, Stephen was accused of blasphemy against Moses. That’s why the Jewish religious leaders stoned him and turned him into the first martyr of Christianity. That’s why he’s known as proto-martyr. 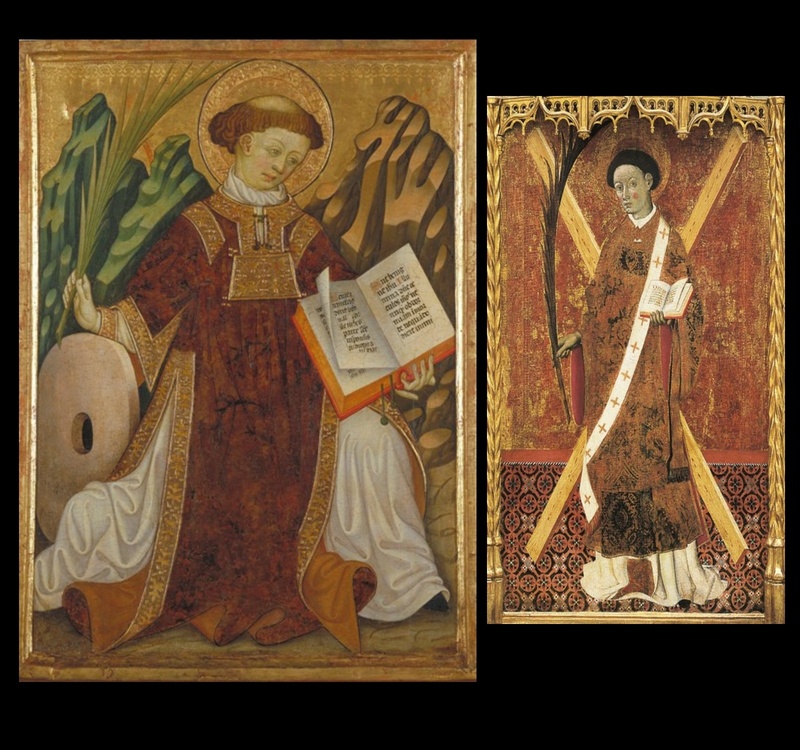 Normally, Saint Stephen is represented with the features of a young man without a beard with a dalmatic deacon. As a martyr saint he carried the palm, and amongst his most representative attributes is the book, an allusion to the defence he made of the word of God, and the stone or stones, the indisputable reference to his stoning. Daughter of the King of Great Britain, Ursula was requested to enter into matrimony by pagan prince. To marry him she put one condition: that the groom had to be baptised and that he should accompany her on a pilgrimage to Rome. The young girl set out with an entourage of eleven thousand virgins, but on the return trip they were all killed in an attack by the Huns. 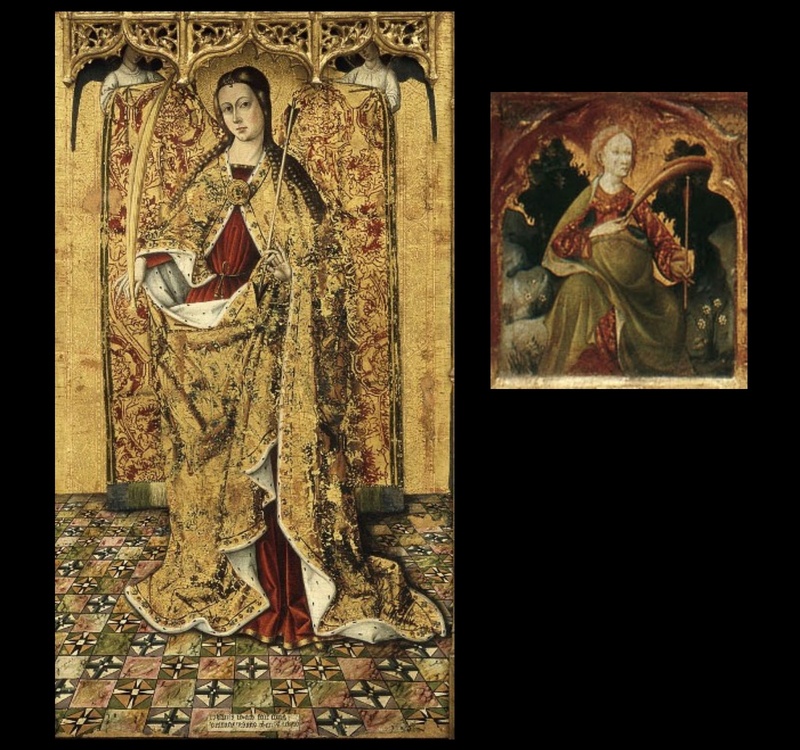 Saint Ursula was dressed richly, for her status as a princess. Generally she appears with the palm of the martyr and a bow and/or a sageta (a sort of arrow) in reference to her tragic death. Born in Zaragoza, Vincent was deacon of Valeri and was martyred in Valencia during the persecution of roman emperor Diocletian, around the year 300. He was condemned to multiple torments: he was flagellated, scratched by iron hooks on a cross, and finally burnt in the grill while soldiers threw salt on the wounds of his skin. Deprived of sepulchre, his body was thrown to the wild animals, but a raven helped him save his life. He was also thrown to the sea with stones tied around his neck but his body floated miraculously. 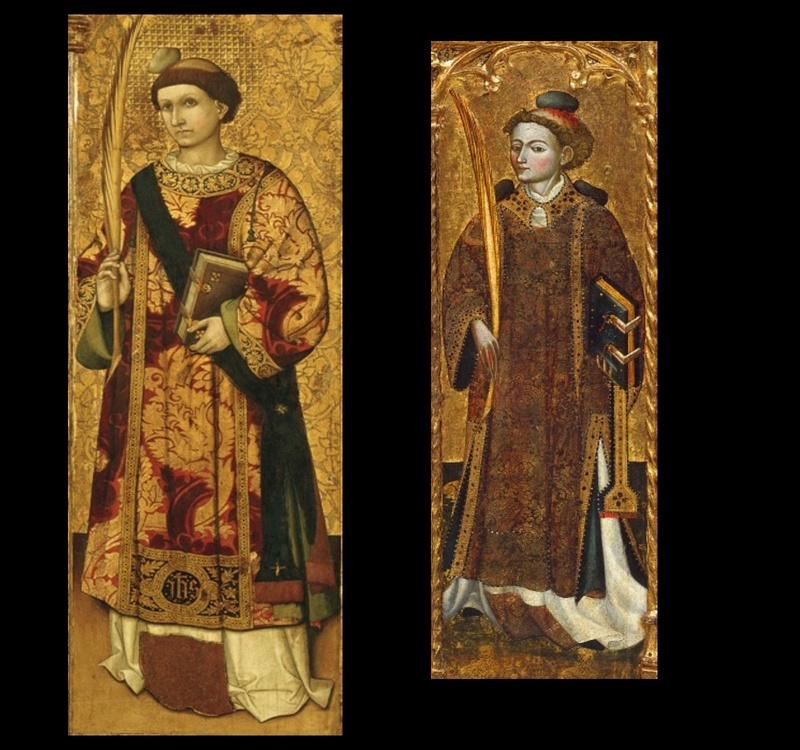 In the Medieval period the saints were considered virtuous and exceptional personalities, with links to that which was divine, reason why they were strongly revered and admired. 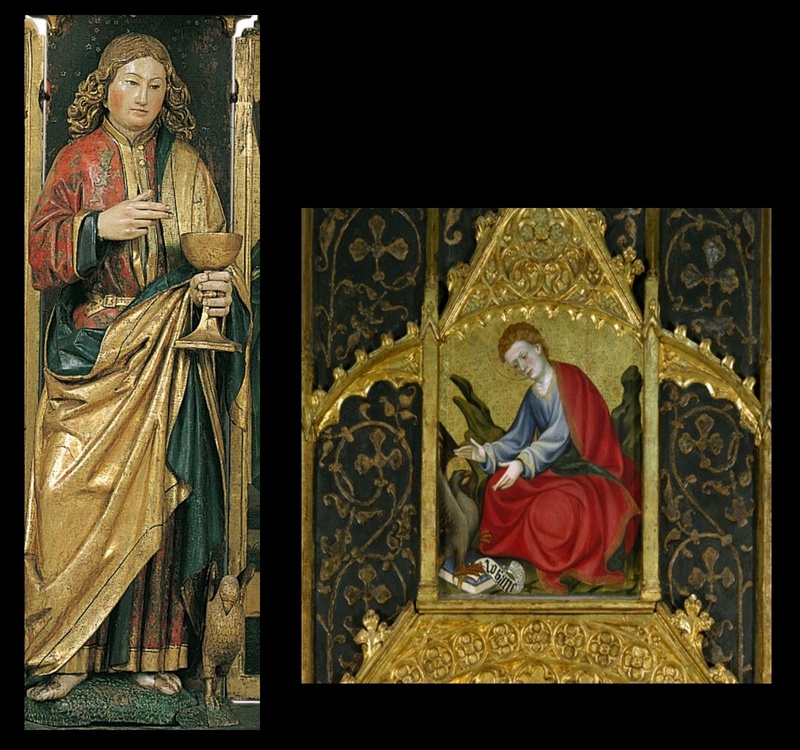 As consequence, the saints took on a notable importance in the artistic representations and that’s how it appears in the museum collection of Gothic art. 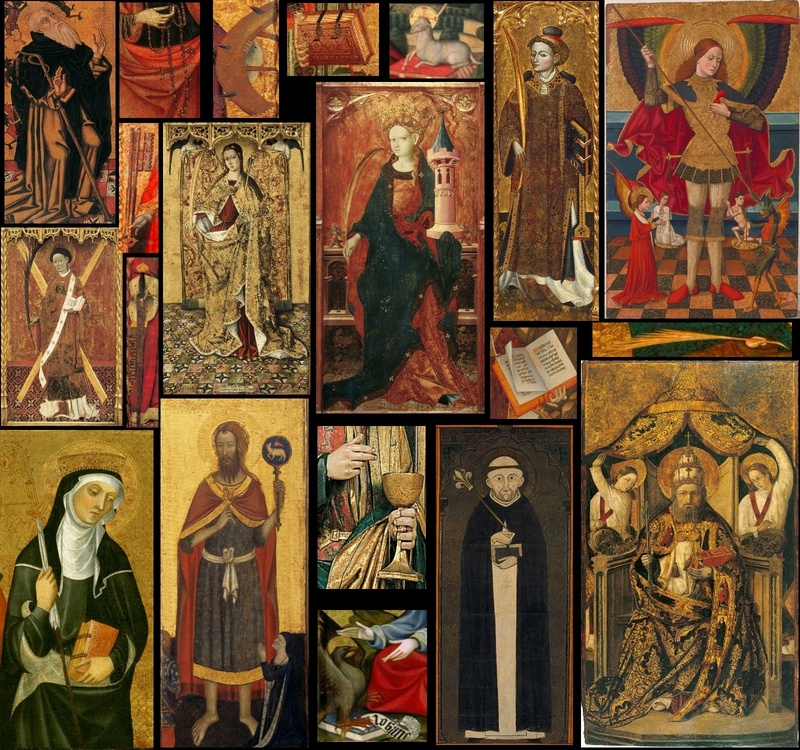 But, how could the faithful identify these figures in a period in which means such as photography didn’t exist and, therefore, their representations weren’t a portrait? 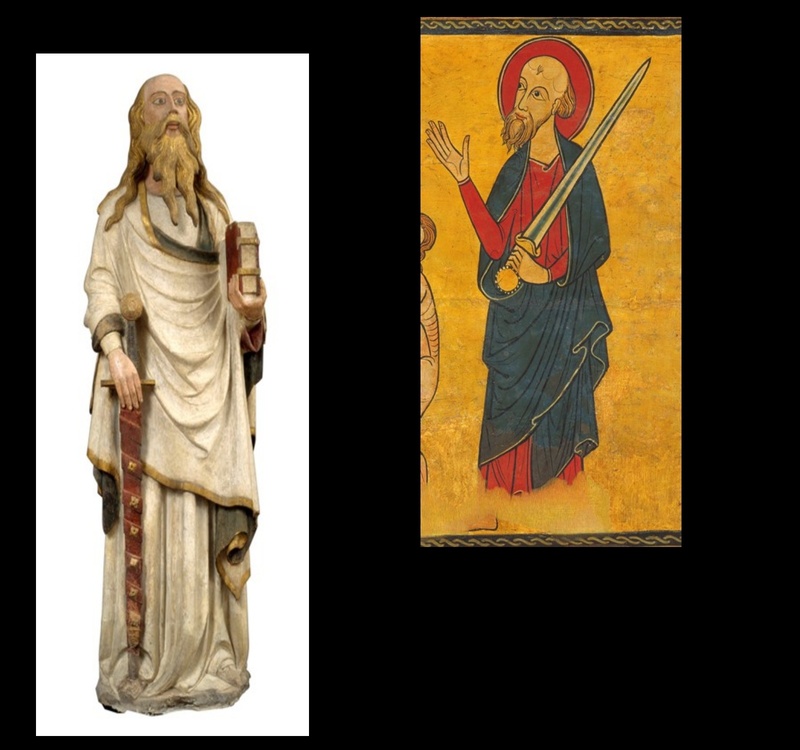 Each of them was characterize with one or more elements that related with their life or martyrdom, forming a simple and effective code to the medieval viewer. These are called attributes.